Located on Toronto’s waterfront in the Port Lands, Tommy Thompson Park is a unique urban wilderness minutes from downtown. One of the most interesting characteristics of Tommy Thompson Park is that the park is located on an entirely man-made peninsula known as the Leslie Street Spit, which extends approximately five kilometres into Lake Ontario. The park represents some of the largest existing natural habitat on the Toronto waterfront. Wildflower meadows, cottonwood forests, coastal marshes, cobble beaches and sand dunes are just some of the habitats at Tommy Thompson Park. Wildlife, especially birds, flourish at the park, which provides one of the best nature watching areas in the Greater Toronto Area. This is a great paddle for those looking to get out and explore the city from a different vantage point! This trip is designed to help newer paddlers improve their paddling skills and to enable them to get out and explore local waterways on their own with confidence. 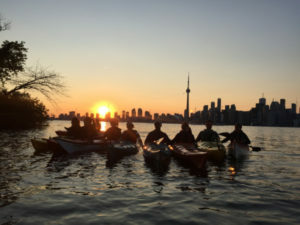 Lead by a certified kayak instructor from The Complete Paddler and a Toronto Region and Conservation Authority Park Interpreter makes this tour very educational as well as beautiful. After meeting at Cherry Beach (TTC accessible) we will have an orientation and go over safety procedures. We will then embark on a relaxing paddle over to TTP, slowing down for photos of the sunset and the city skyline. The tour will include stops along the western shore of this urban wilderness, where we’ll learn about the park’s history, wildlife and admire the incredible views. The return paddle will be at dusk with kayak lights and the city lighting our way home. This tour is beginner friendly and suitable for all ages. An average fitness level is highly recommended. This trip is lead by certified instructors and all equipment is provided by The Complete Paddler. Kids under 14 must be accompanied by a guardian. The only gear you need to bring is warm clothing. We may at times need to cancel or re-schedule an event due to low registration or inclement/adverse weather. Should this occur, participants will be notified, and all applicable fees will be refunded. Payments made by credit card will be credited back to the original card used for payment within 2-3 business days. Payments made by cheque or cash will be refunded by cheque in the mail, within 4 weeks. Credits towards another tour date is also possible. When you book your tour, we save a spot that is just for you, as such, a 48 hour cancellation policy goes into effect at the time of booking. If you cancel your spot with less than 48 hours notice, you will not be eligible for a refund. Unless we cancel a tour due to inclement/adverse weather, refunds associated with weather conditions will not be issued. Event cancellations may occur due to extreme conditions such as severe snow or ice storms, extremely heavy rainfall, high winds and/or in the event of lightning or lack of power. Since most of our events are held outdoors with limited place to take cover, please come prepared. The Complete Paddler makes every effort to proceed with an event as planned and will reopen its venues as quickly as possible once inclement/ adverse weather conditions cease and the safety of our clients is not threatened.